I am trying my hand at making a 2-layered, chiffon, handkerchief skirt, and I've found your 8-point skirt advice most helpful! However, since I'm very new to this, I was wondering how to sew the hem of the skirt to give it that "puckered" ruffled look. Do you just edge-stitch it like usual and let the natural folds of the skirt give it that tousled look? Or is there a trick to working with this material? 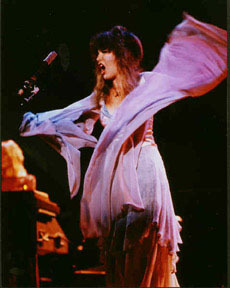 To see what I mean, check out the skirt in this picture of Stevie Nicks. Click on the photo to see it in more detail. I'm betting that Stevie Nicks is wearing silk chiffon. This is softer than synthetic and drapes quite differently. You can find it in the nicer fabric stores in colors, and the price varies a lot. I buy silk chiffon for a low price in white online and dye it. Also, she may be wearing her handkerchief skirt cut on the bias instead of the straight grain of the fabric. This would stretch slightly when sewn, creating that rippled appearance when hanging. And the edge hem is extremely small. Stevie Nicks might have a rolled scarf hem, which is done on a specialized serging machine. I just bought a special foot to do this for my own Juki serging machine. Another name for this type of hem is lettuce edging. If working with a knit fabric, this hem can be made by stretching the fabric while sewing the hem. If working with a woven fabric such as chiffon, the handkerchief skirt will need to be cut so that its edges are on the bias rather than on the straight of grain. Stretch the edges while sewing the hem. Ask the Costume Goddess: Making a Handkerchief Skirt. Instructions on how to make one. How to Make a Narrow Hem. Instructions for a different style of hem.